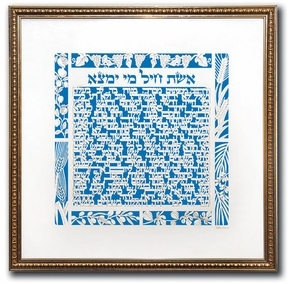 Framed Woman of Valor Judaica T1200. 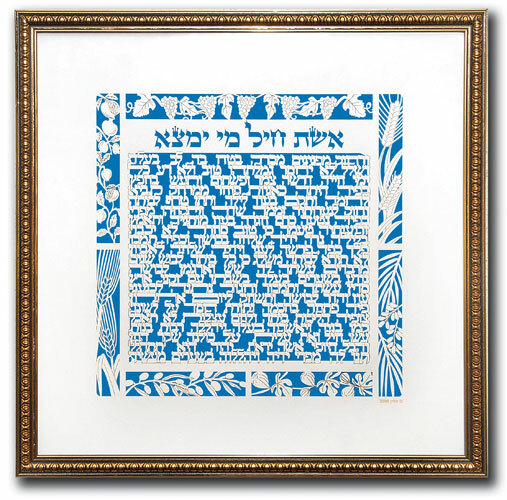 This amazing Framed Woman of Valor Judaica measures 16.9 X 16.9 Inch. Made with laser cut on wood and paper with glass cover. With the Seven Species lasere cut decorations. Kosher Judaica. Made in Israel. Shipped from Israel. We will ship it with love and care. Try our gift wrap service. The Woman of Valor, Eshet Chayil, is the poem King Solomon concludes the book of Proverbs. According to Jewish mysticism, Kabbalah, the poem is a reference to the Shabbat Queen, the spiritual soul-mate of the Jewish nation. The Woman of Valor has become a Jewish custom for men to recite at the end of the week. The husband thanks his wife for all she has done for him and their family throughout the week. An accomplished woman, who can find? Her value is far beyond pearls. Her husband's heart relies on her and he shall lack no fortune. She does him good and not evil, all the days of her life. She seeks wool and flax, and works with her hands willingly. She is like the merchant ships, she brings her bread from afar. She arises while it is still night, and gives food to her household and a portion to her maidservants. She plans for a field, and buys it. With the fruit of her hands she plants a vineyard. She girds her loins in strength, and makes her arms strong. She knows that her merchandise is good. Her candle does not go out at night. She sets her hands to the distaff, and holds the spindle in her hands. She extends her hands to the poor, and reaches out her hand to the needy. She fears not for her household because of snow, because her whole household is warmly dressed. She makes covers for herself, her clothing is fine linen and purple. Her husband is known at the gates, when he sits among the elders of the land. She makes a cloak and sells it, and she delivers aprons to the merchant… What a great words of wisdom and love.